... aside from not opening its overheated pages, that is. But when you do - here's the Opinion spread this morning. Yes, Comment is indeed Free; and opinions cheap. May dragging the UK under ... Brexit to cost Britain dear ... Britain is in chaos ... Tories may destroy the Union ... the Brexit fanatics are at the helm ... time for Wales to start talking about Independence ... May must not trigger Article 50 ... (leavened with a little squeak of ... I feel ill at the thought of another referendum in Scotland). Wow. Enough to make any of us feel ill.
Well. I've been travelling a bit recently, and took the opportunity to re-read Fitzroy Maclean's fabulous memoir of his legendary exploits in WW2 (special forces ops in the western desert and Yugoslavia) and the years preceding it, Eastern Approaches. And not just his own stirring deeds. Have a read of this and put the Scotty fish-woman out of your mind. This is what Britain is made of. No account of events on Vis [an island off Yugoslavia] would be complete without some mention of Admiral Sir Walter Cowan [who] had, after a long and distinguished career, retired from the Navy in 1931, at the age of sixty. In 1939, the outbreak of war, he had managed to get himself re-employed, and not wishing to stay at home, he had himself sent out to the Middle East which, he felt, offered more scope to a man of his tastes. He had always enjoyed fighting on shore, preferably hand to hand, as much or more than fighting at sea, and had won his D.S.O. in the Sudan serving under Lord Kitchener in the 'nineties. Accordingly, at the age of seventy, he attached himself to an Indian Cavalry Regiment serving in the Western Desert, with the rank of Commander R.N. and in the somewhat ill-defined position of Naval Liaison Officer. In this capacity he took part in a number of Commando raids, startling all concerned by his complete disregard of danger. But in those days things were not going as well as they might in the desert and one day the party he was with had the misfortune to be completely overrun by a strong force of German tanks. Admiral Cowan was last seen advancing sternly on one of the enemy's tanks, discharging his pistol at it from point-blank range. Last seen, that is, until, having escaped from his prison camp, he appeared a year or two later in Italy and immediately attached himself to Tom Churchill's Commando Brigade. Those of us who had known him in the desert were delighted to see him reappear on Vis, as frail-looking, as dashing and as friendly as ever. There he was to end the war, adding, at the age of seventy-three, by his gallantry on a raid, a bar to the D.S.O. which he had won half a century before. What a man! What men they were indeed. I think we can safely ignore the Guardian comment pages/blogs. 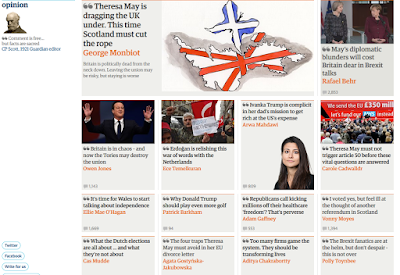 The Graun is just as much "click bait" as the rest of them. It is a handwringers' Daily Fail - the difference is that hardly anyone actually reads the left-wing version. I like the sound of Cowan...! Time enough for you yet then, ND. Reading yesterday about Fred Selous, a Boy's Own hero, shot by a sniper at 65 while leading an attack (the SAS of former Rhodesia, the Selous Scouts, were named for him). On the Guardian, C.S. Lewis was prophetic. If we must have a tyrant a robber baron is far better than an inquisitor. The baron’s cruelty may sometimes sleep, his cupidity at some point may be sated; and since he dimly knows he is doing wrong he may possibly repent. But the inquisitor who mistakes his own cruelty and lust of power and fear for the voice of Heaven will torment us infinitely more because he torments us with the approval of his own conscience, and his better impulses appear to him as temptations. And since Theocracy is the worst, the nearer any government approaches to Theocracy the worse it will be. A metaphysic held by the rulers with the force of a religion, is a bad sign. It forbids them, like the inquisitor, to admit any grain of truth or good in their opponents, it abrogates the ordinary rules of morality, and it gives a seemingly high, super-personal sanction to all the very ordinary human passions by which, like other men, the rulers will frequently be actuated. In a word, it forbids wholesome doubt. A political programme can never in reality be more than probably right. We never know all the facts about the present and we can only guess the future. To attach to a party programme — whose highest claim is to reasonable prudence — the sort of assent which we should reserve for demonstrable theorems, is a kind of intoxication. Even in a democracy there is a priesthood to be resisted. I recall someone (was it Cherie Blair?) saying that she'd gone into law to make changes to society. The traditional routes for making changes to society used to be politics or religion. We've seen the legal priesthood in action for 40-odd years now. Think of the amount of effort devoted to the rights of the criminal compared with the rights of their victims. "The government's new xxxx policy will face a legal challenge this morning ..."
Firing a pistol point blank at a tank! Guess he was a little bit peeved! Whadda guy! I also expect his missus had a fine line in passive aggression - "well, if that's what you want to do - go on then, have fun, try and write ocassionally!" I always console myself with the thought that, under their favoured regime, their offices would be raided, the staff taken to the nearest Gulag and Polly taken out and shot. Like Sturgeon, their nightly prayer must be "Oh God, don't let my dreams come true!". Travel certainly improves the reading time. of course they wouldn't last very long at all. The thing is it just doesn't occur to the majority of them. I think you are however spot on re Sturgeon. Nick's DSO took years to be revealed on these pages and only at the right moment. The man is sheer class ! If I had one I'd be dropping it into every topic, which is probably why I don't have one. Kev, you get a medal for service to blogging...or something like that.